JERUSALEM -- The Israeli military says the shooting of Razan Najjar, a 21-year-old volunteer paramedic who shot dead on Friday, was unintentional. Najjar was shot as she tried to help evacuate wounded Palestinian protesters near Israel's perimeter fence with Gaza. The military said Tuesday that an initial examination determined that "no shots were deliberately or directly aimed at her." The investigation was ongoing, the military said. U.N. officials have condemned Najjar's killing, saying that witness reports indicated she wore clothing that clearly identified her as a health worker. "The killing of a clearly identified medical staffer by security forces during a demonstration is particularly reprehensible," said Jamie McGoldrick, the local U.N. humanitarian coordinator. The U.N. Office for the Coordination of Humanitarian Affairs said it and other agencies were "deeply concerned" and called for the protection of medical workers. Fares al-Kidra, a colleague of Najjar, said they were approaching the perimeter fence to evacuate a wounded man and, as they were leaving, three gunshots were heard and Najjar fell to the ground. Al-Mezan, a Gaza-based rights group, said Najjar was 100 meters from the fence and wearing a clearly marked paramedic's vest when she was shot. Social media videos and Associated Press footage showed Najjar and a cohort of medics walking toward the fence and raising their hands to reach a wounded man lying on the ground. Najjar wore a dark blue headscarf and a white coat with the logo of the Palestinian Medical Relief Society, where she volunteered. Izzat Shatat, 23, a volunteering ambulance worker, said he and Najjar were set to announce their engagement at the end of the holy month of Ramadan. He said he was worried and asked her not to go to the border area Friday but she refused. "She helped all people. She has never refused to help. She was the first to run toward anybody when he is shot," he said in tears. The Khan Younis hospital said Najjar had a gunshot wound in the chest with an exit wound in the back. The Israeli military has said its troops operated "in accordance with standard operating procedures" and that it was investigating the incident. On Saturday, thousands of Palestinians, including hundreds of medical workers in white uniforms, took part in a funeral procession for Najjar -- the second woman among more than 115 Palestinians who have been killed by Israeli army fire since Gaza border protests began in late March. 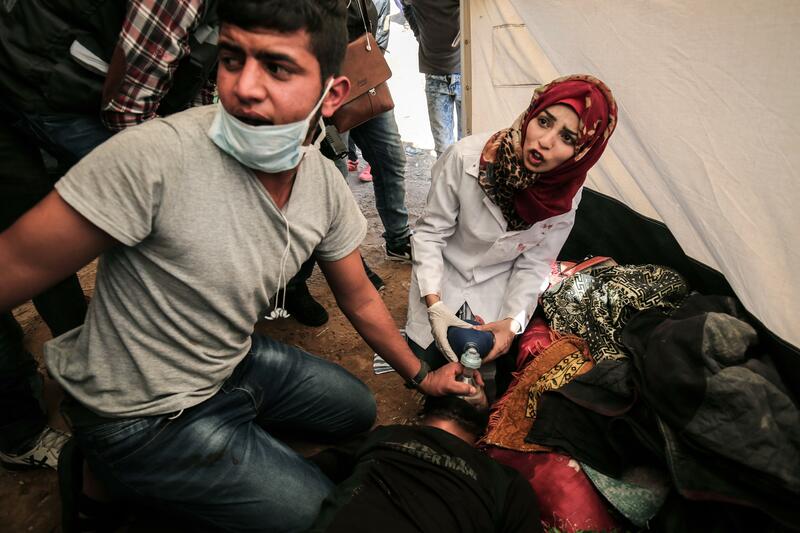 Israel says it has aimed only at instigators and fired at their legs. But the high casualty count has drawn heavy international criticism. Most of the Palestinian casualties have been unarmed. Since 2015, Palestinians have killed over 50 Israelis, two visiting Americans and a British tourist in stabbings, shootings and car-ramming attacks. Over 260 Palestinians were killed by Israeli forces in that time. Israel says most were attackers. The attacks have petered off in recent months as the Palestinian focus has shifted toward mass protests at the Gaza border that are being organized by the territory's militant Hamas leadership and are aimed at drawing attention to the decade-long Israeli-Egyptian blockade on the territory. On Friday, the Palestinians protested for the 10th week in a row. The Israeli military said some hurled grenades and pipe bombs at troops behind the border fence. Some 40 Palestinians were wounded. Najjar was the only one killed. Najjar's body was wrapped in a Palestinian flag as the funeral procession started Saturday from the hospital and passed near her home in Khuzaa, a village near the Khan Younis that is close to the border and has served as one of five protest encampments across Gaza in recent weeks. Her father carried her blood-stained medical jacket, and some mourners demanded revenge, the BBC reported.